Lifetime Goal: "When it's all finished, and the Lord has called me home, there's just one thing I hope people will be able to say about me. And that's 'Well done kid." Kurt Carr grew up in a family who believed in Jesus but were not "deeply involved" in the church experience. The Lord had other plans for Kurt, whose musical gifts and talents became evident early in his life. At the age of 13, Kurt Carr, who felt an unknown need, found himself being drawn to a church family. By himself, without his family, he quickly became an active member in the church's music department, where he could express his passion for music. While his musical abilities found a place where he could develop them, his personal relationship and walk with Christ took a few more years to develop. Kurt Carr comments in his information given to reviewers, "I think the Lord brought me along in a gradual sort of way until around 17. I began to realize that there was a greater meaning and higher calling to what I was doing. I heard Him telling me this was what I was supposed to do with my life, and that He was going to use me for His purposes, and I accepted that and Him. But I never for a second dreamed He would ever use me to this magnitude. It's been quite amazing to me." The Lord was patient, and allowed Kurt to grow both musically and spiritually through further musical training and experiences and the careful placement of other spiritual influences and mentors in Kurt's life. After high school, Kurt Carr was accepted into the University of Connecticut's music program, studying classical music, where he earned his Fine Arts degree. While in college, Kurt Carr found a mentor in Gospel legend, Richard Smallwood who was classically trained in music and old school Gospel, but had the insight and musical skill to integrate elements of other styles of music in composing Gospel music. 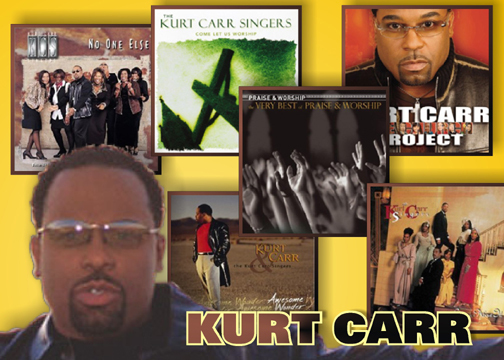 As Carr's mentor, he inspired and helped Kurt Carr to develop his own talent of being able to compose creatively Gospel music which adds these elements of other genres. Kurt Carr had a musical background which also included the absorption of secular popular music in his community and from the world as well, all which added to his musical composition abilities, though his first love was Gospel music. Kurt Carr was led by the Lord to be Andrae Crouch's piano accompanist for Crouch's music ministry for one year, which inspired Kurt Carr to someday to be used by the Lord via his own music ministry to promote Jesus Christ. He also was moved spiritually by Andrae Crouch's wife, Jan, who shared her testimony with Kurt, an important event which drew Kurt closer to Jesus. After playing one year at the annual conference of the Gospel Music Workshop of America, new doors of opportunity and spiritual growth opened up for Kurt. Rev. James Cleveland, who was impressed by Kurt's musical abilities, hired him to be musical director and pianist for Rev. Cleveland's ministry, which Kurt was employed at for 7 years, until 1991, when Rev. James Cleveland went home to be with the Lord. This position gave Kurt some national recognition of his tremendous talent, as well as further grounding and nurturing his relationship with Christ. Both of these positions, playing for Andrae Crouch and being Rev. Cleveland's music director and pianist, opened up yet other doors for opportunity and spiritual growth. Kurt Carr became the Creative Director at the West Los Angeles Church of God in Christ, where Kurt Carr had the opportunities to work with both Gospel and secular musical artists, such as Stevie Wonder, Gladys Knight, Yolanda Adams and Kirk Franklin. Being in Los Angeles, Kurt Carr formed a six-member vocal ensemble of talented Gospel singers, called The Kurt Carr Singers in 1989, a group that kept him busy in a ministry when he wasn't focussed on his duties for West Los Angeles Church of God in Christ. His music is an interesting blend of traditional Gospel composition and vocals, elements of R & B, jazz, soul, blues, and the distinct modern harmonies and singing style found in Urban Contemporary Gospel. Under the inspiration of the Holy Spirit, Kurt Carr had drawn on his Gospel roots and elements of modern urban contemporary music to create inspiring Gospel music which has touched many people, for 14 years in his church position as music director, and his tours, concerts and albums made with The Kurt Carr Singers. His developed spirituality, anchored in a relationship with Jesus and his maturing and evolving musical abilities came together to create a music ministry to promote Jesus Christ, which was the Lord's plan for him all along. thoroughly steeped in the traditional sound of Gospel." (Released 1997) - NO ONE ELSE - Album was well-received and sold very well, an important stepping stone to his next album. A song originally recorded on this album, "For every Mountain" was recorded again by the Brooklyn Tabernacle Choir who won a Grammy Award for it. The song has since been recorded by 10 other artists! (Released 2000) - AWESOME WONDER was released and was widely loved, selling more than 500,000 copies at that time, and now is nearing the 1 million mark today - Carr's break through album earned him 4 stellar awards at the 20th Annual Gospel Music Awards; Male Vocalist, Album, Producer and Group in the Urban Contemporary Gospel genre. As to be expected, Kurt Carr and the Kurt Carr Singers found themselves in demand on the tour scene, though Kurt still maintained his commitment to being the worship director at the West Los Angeles COGIC Cathedral, and helping other up and coming Gospel talent like Byron Cage, by producing their first albums, giving his musical expertise to others to help them not only advance in the music business, but most importantly offer songs which uniquely grab the listener and nurture their faith; all for the glory of the Gospel of Jesus Christ. Kurt Carr's song, "The Presence of the Lord" so wonderfully performed by Byron Cage and his choir won Stellar Song of the Year, and Kurt himself won 4 more Stellars for his role as producer of this same 2003 album, entitled THE PRESENCE OF THE LORD IS HERE. Byron Cage also won the Stellar Award for New Artist of the Year. Mission Statement: Inspired by Matthew 28: To go forth into the world, making disciples of all nations, through the power of the Holy Spirit. Theme of CD is "One Lord, One Faith, One Baptism, One Church." Kurt Carr explains, "I've felt God impressing on me that it was time to really reach out to the world with our music (Kurt Carr Singers), so it was very important to me to draw on the talents of people of different races, nationalities, and doctrinal background - all to solidify the theme and the truth that we really are one church in Christ. I think there's something on this album that all believers will be touched by." Kurt Carr has not let any of this success go to his head, as he remembers the main purpose of being in a Christian music ministry, staying true to his special calling. For Kurt Carr was and is one talented, busy composer, arranger, singer, instrumentalist, music director, and producer who loves Jesus Christ and His Gospel, a truth that became clear to the Christian music community through Carr's actions and the fruits of the Spirit so evident in his life and his creative musical efforts in Gospel music.